Designed by Arielle Condoret Schechter, AIA, this small, modern, age-in-place house is part of the Fall 2017 Modapalooza Tour. July 19, 2017 (Chapel Hill, NC) — “The Professor’s House,” a small, sustainable, age-in-place house overlooking Morgan Creek in Chapel Hill, has been selected for the Fall 2017 Modapalooza Tour on Saturday, September 16, sponsored by North Carolina Modernist Houses (NCMH). Chapel Hill architect Arielle Condoret Schechter, AIA, designed the house for a retired professor of Native American Studies. 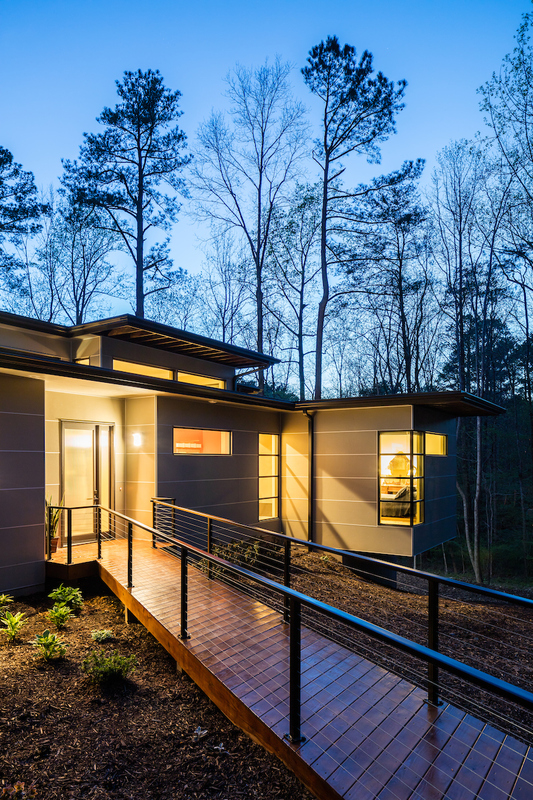 A widow now, she wanted to downsize from her 3200-square-foot house and live with her dog in a modern, age-in-place house in a quiet, wooded neighborhood in Chapel Hill, NC. She contacted Schechter because she’d heard about the Micropolis Houses®, a collection of modern “tiny house” plans Schechter designed that range from 150 to 1500 square feet and can be customized to meet specific buyers’ needs and preferences. In this case, the professor wanted to add a third bedroom/office and an extra bath to the Micropolis® plan she chose. A bridge from the parking area to the front door means guests won’t have to maneuver any steps. “A small house meant she could have things like a swimming pool, a Japanese soaking tub, and choose nicer elements for her money,” Schechter noted. For more information on The Professor’s House and architect Arielle Condoret Schechter, AIA, visit www.acsarchitect.com. September 15, 2010 (CARY, NC) – Nowell’s Contemporary Furniture in Cary will host the Triangle Modernist Houses’ “ModStock House Tour Party” on Thursday, September 23, from 6-8 p.m. Free and open to the public with registration, the party will kick off the TMH’s 2010 Modern Homes Tour in Raleigh on the following Saturday, September 25,from 1-4:30 p.m. The 2010 tour is the 14th tour of Modernist homes that the non-profit preservation organization has sponsored in its three-year history. The Nowell’s ModStock Party includes beer and wine, sodas and snacks, and the opportunity to see thousands of square feet of Nowell’s extensive modern furniture and furnishings. At 7 p.m., TMH founder George Smart and Nowell’s owner Jerry Nowell will give away gift certificates and other prizes. Nowell’s is located at 900 East Chatham Street, Cary, NC 27511. Space is limited for the ModStock party so advance registration is required. To attend, send an email with your name and number of free tickets to george@trianglemodernisthouses.com. The TMH 2010 Modern Homes Tour on September 25th will take place in Raleigh and feature eight modernist houses as well as one iconic mid-century office building. Tours originate in the parking lot of Small Kane Architects near the intersection of Glenwood Avenue and Glen Eden Drive. Free shuttle buses take participants to all of the destinations on the tour throughout the afternoon. Hop on, hop off at your leisure. Tour hours are 1-4 p.m. General admission tickets are $24.95 in advance through Wednesday September 22, then $29.95 on the day of the tour. Sponsors for the 2010 tour include The Downtowner Magazine, The Independent, Preservation North Carolina, Preservation Greensboro, Historic Charlotte, the North Carolina Symphony, the Gregg Museum at NC State University, the Cameron Art Museum in Wilmington, NC, Tonic Design + Tonic Construction, Center Studio Architecture, the Raleigh chapter of Architecture for Humanity, the City of Raleigh Raleigh Urban Design Center, Outdoor Images, Quail Ridge Books, Beyond Blue Interiors, Ambiente International, Eidolon Designs, Modern Home Network.com, and Nowell’s Contemporary Furniture. For all the details about the fall homes tour, visit www.trianglemodernisthouses.com/2010. For more information on Triangle Modernist Houses, go to www.trianglemodernisthouses.com. 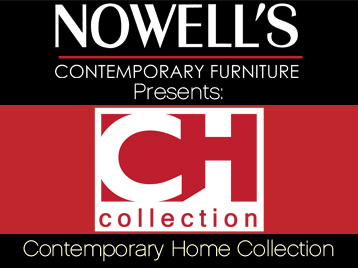 For more information on Nowell’s Contemporary Furniture, visit. www.nowellsfurniture.com. Triangle Modernist Houses (TMH) is a 501C3 nonprofit established in 2007 to restoring and growing modernist architecture in the Triangle. The award-winning website, now the largest educational and historical archive for modernist residential design in America, continues to catalog, preserve, and advocate for North Carolina modernism. TMH also hosts popular modernist house tours several times a year, giving the public access to the Triangle’s most exciting residential architecture, past and present. These tours raise awareness and help preserve these “works of art” for future generations. Visit the website at www.trianglemodernisthouses.com. TMH also has an active community on Facebook.